Are you a little nutso for sewing? Do you fantasise about uninterrupted sewing time or crave some much needed "me" time? Would you like to get away from it all, escape to the country, surround yourself with like-minded "nutso's", be fed and watered (and fed very well I might add) for a whole weekend without lifting a finger AND sew into the wee small hours should you so desire? Well, I've got a little secret to share with you. You can. Yep. I'm not lying. Turn your fantasy into a reality and go on a Sewing Retreat! They are the best. They are soul-replenishing. They are a hoot. They are rewarding. They are a must! I've just returned from my second "Sew Along" retreat run by the gorgeous and mega-experienced (not to mention mega patient!) Jemima Flendt of Tied with a Ribbon and Claire Turpin of Claire Turpin Design. They hold their weekend retreats at the Avalon Homestead in Toodyay, Western Australia - seriously the perfect location, only an hour from Perth, and set high on a hill overlooking the Avon Valley. It feels like you are far more than an hour from the city. Whether you are a beginner sewer (like me) or advanced, whether you're a quilter or more of a project sewer (like me), the retreat caters for all. Jemima & Claire are on hand all weekend to offer advice, encouragement and mini workshops. The retreat runs from Friday afternoon to Sunday afternoon and all meals are included - but be warned, dessert is served at every meal and it is very, very difficult to resist. Also included is a "mystery project" which is normally the first project on the first night - a bit of an ice-breaker and a bit of easy fun - but it's completely up to you if you want to do it or not. If not, you still get to take the mystery kit home to work on another day. They also throw in two free patterns for you so not only do you totally get your money's worth, you're getting some lovely little extras. It really is a well-run, well-organised, well-planned retreat absolutely choc full of creative goodness and oh-"sew"-fabulous people all wanting the same thing ... to sew, and sew, and sew ... and eat a lot of a bit of chocolate mousse in between!! Last year, for my daughter, I made this "Living With Punk's" Bookworm Skirt (I didn't blog about it but I did take some little piccies) and this year I made her a Swimming Robe made from bath towels. I also made an Apron for my Mother-in-law (which is meant to be a surprise so I'm hoping she misses this post). 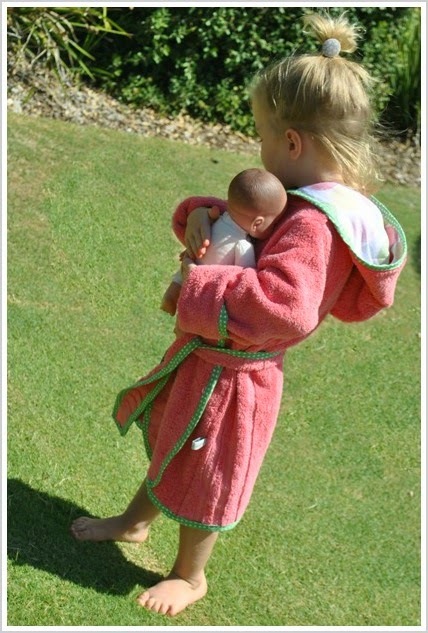 The swimming robe was a "Dana Made-it" pattern which I came across via the Probably Actually blog. Seriously, if you want to see sewing at its best then you must check out Gail from Probably Actually's blog - her stuff is drool-worthy. To make the robe I used two bath towels from Target (2 for $8 - ha! ), a really lovely organic fabric called Gumdrops Red by Monaluna for the hood (my favourite bit of the whole robe ... too cute! ),which I bought from Lima Sews, and a green spotted extra wide bias binding from Spotlight. The actual pattern is simple and would suit an experienced beginner sewer - it's really just the insane amount of bias binding that is a bit tricky for a newbie (I may have said a couple of bad words quietly under my breath, or out loud, I can't be sure). But if you take it slow and pin, pin, pin like crazy, it can actually be quite therapeutic and if my machine hadn't been playing up (totally my fault - no service in two years!! ), it would have actually been a fairly stress-free experience. 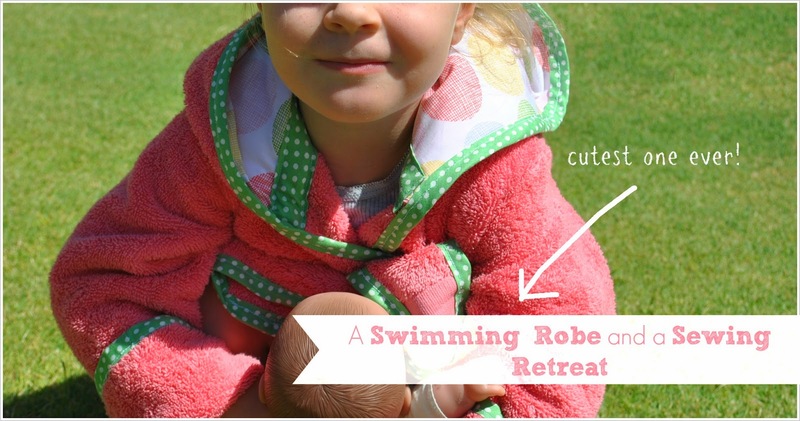 I do think it's the bias binding and the lined hood that makes this swimming robe a total adorable winner so it really is worth going to the extra effort (just whisper the naughty words). The only adjustment I made to the pattern was making the hood a little bit longer as Gail had mentioned in her blog that the hood was a bit short for her daughter. I can't wait to road test it at the pool this Thursday! For the secret-squirrel Apron, I used an organic floral voile from Spotlight (sorry I cut the selvedge off the fabric and I can't remember the name of it) and a pink polka dot cotton for the lining. This is a super-easy pattern and is a good first project. I used this pattern from Ink & Spindle which is free - yes, free! Pretty great. 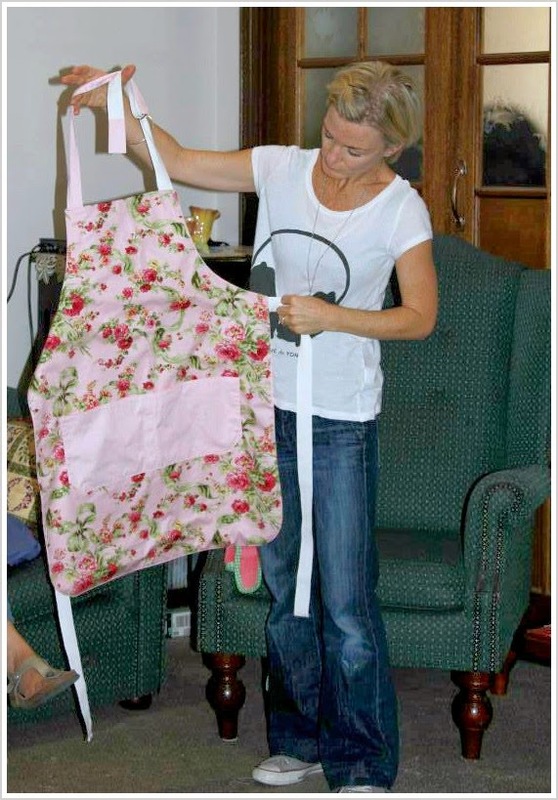 Sorry, I didn't get a very good shot of the Apron - this one is me holding it up during "show & tell" at the retreat, which happens on the last day. We all sit around and goo and gah at what everyone has achieved over the weekend. So, all in all, a really fabulous weekend with an equally fabulous group of lovely women all passionate about sewing and creating. Such creative love in one room ... ahhhhh, can we do it again next weekend? Please? Have you been to a sewing retreat or a creative-style retreat? Did you love it? Did your cup runneth over? Do share. The robe is adorable, she looks like a little strawberry! :) And good job on all that bias, it's no easy task! I love the hood lining fabric - great choice. Also, her babies in the stroller - hilarious. Keep up the excellent sewing!! That retreat sounds fantastic! I confess, I haven't even tried to get my machine out in the last five years… I tried before that with just a three year old and got nowhere, and didn't even attempt it once the second one came along. Besides, my favourite part of sewing is fabric browsing! I've still been able to do that, but you've inspired me to get going again. Love the robe! If you're a beginner sewer then I am totally amazed!! I would love to do one of these retreats! Maybe when my babies are older! You have a lovely blog - really sweet! Shall be visiting again!